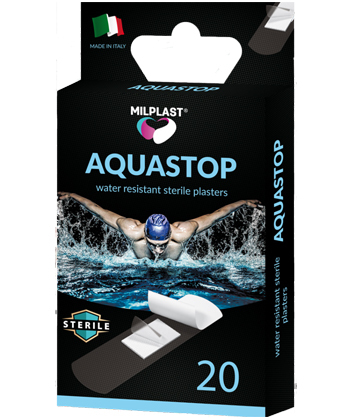 The Milplast Aquastop water-resistant plaster reliably protects your damaged skin area against water and dirt. This protection is especially important during active water-based recreations: sea or lake swimming, visiting of swimming pool or water parks, bathing or showering. In addition, the plaster will be useful during cleaning, clothes and dishes washing. The plaster elasticity allows its application on any skin area, while its transparency ensures the invisible protection. Milplast Aquastop can be removed easily and painlessly, without remains on the skin. 2. Open plaster package, remove protective paper strips and tightly fasten the plaster on the damaged area. 3. Remove blue protective film.